Here is a list of some questions I am asked on occasion, hopefully you find the answers helpful. If you still have questions or need clarification, send me a note though the contact page. Q. How should I clean my jewellery? A. I recommend using a mild hand soap, warm water and a used toothbrush, but not toothpaste! Rinse the jewellery well, making sure to use a bowl or plug the sink drain! Some people think that showering with jewellery is ok, but typically their pieces are full of soap residue and aren't really clean. I'm not a fan of jewellery 'dips', a liquid cleaner available in many jewellery stores, I don't find them very effective. 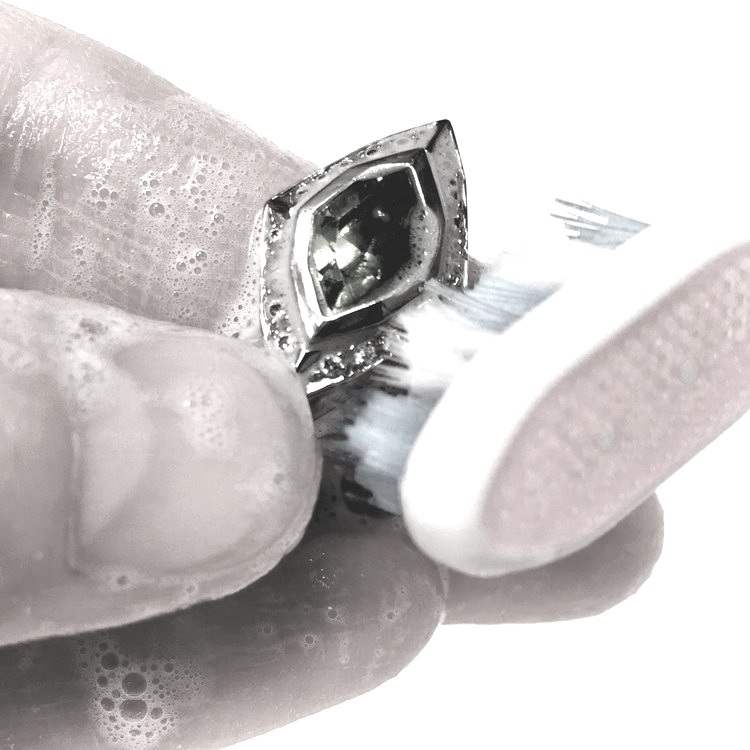 I also recommend to have your jewellery cleaned and checked by a goldsmith once a year, they have equipment and skills to do a really thorough job. Having them check the jewellery means that minor repairs can be suggested and completed before the wear and tear gets out of hand. Q. I've heard about rhodium plating, is this something you use? A. Rhodium is a metal commonly used in mass production jewellery to plate off-white gold to make it appear whiter and is often misrepresented as a benefit to the consumer. It is a surface treatment that wears off with use, sometimes in as little as a few weeks. This can be alarming if you find your once white gold ring is now patchy and yellowish. Pieces can be re-plated, but it will wear off again. It serves no other purpose than for aesthetics in mass production jewellery as it does not provide strength or durability to a piece as is sometimes claimed. I do not plate my white gold jewellery, instead, I use a white gold alloy that is white all the way through. This white gold alloy is tougher to work with but the end result is better and the client is not left feeling deceived. Q. Does silver tarnish? If so, how do I prevent it? A. Silver does naturally tarnish over time with exposure to air and moisture. Ways to deal with tarnish are to store your pieces in small ziplock bags with the air removed, use anti-tarnish strips and keep your jewellery away from water containing sulphur, like some well water or hot springs. Elastic bands are to be avoided as they contain sulphur as well. If your silver does tarnish, using a small polishing cloth does wonders to remove it. Q. What about metal allergies? A. Nickel is typically the culprit in jewellery related allergies. Costume jewellery and some alloys of white gold contain nickel in varying amounts. The estimates for nickel allergy vary widely from 5-20% of the population. This variance has to do with how much contact people have to nickel which builds up to having the allergy. The allergy is a contact dermatitis and is noticed most often by a rash caused by nickel-releasing costume earrings or clothing fasteners like the buttons on jeans. Knowing if you've had these reactions can help you to decide on using alternatives for white metal jewellery, palladium, palladium white gold (grey colour), platinum or silver are options. Q. What about silver allergy? A. This is not so much a direct allergy to silver but to the oxides that form as a result of chemical reaction. Some people get irritation and a discoloured finger when wearing silver, they usually see that their silver tarnishes more quickly than other people too. The reason for the discolouration is due to the chemicals and elements that are released through our skin. The skin sweats and releases oils, for some people the composition of their sweat is such that it reacts or oxidizes with silver more readily. Certain medications can also cause this to occur as they are excreted through the skin. Ways to mitigate this are: having a slightly looser fit of ring to provide more air circulation, coating the inside of the ring with lacquer,gold or rhodium plating, or buying jewellery made of gold, platinum or palladium. Q. How should I care for my meteorite jewellery? A. I do work with meteorite, so sometimes this question comes up. Meteorite can rust easily since it’s like steel or iron but not like stainless steel. It takes a bit more care than other jewellery for that reason. When not being worn, keeping your meteorite sealed in plastic zip bags with silica gel packs/ desiccant packs inside (like those you might get in shoe boxes etc.) helps to keep moisture away. Oiling the meteorite also helps a lot. It’s really all about keeping moisture away, even humidity in the air causes them to rust, and some varieties of meteorite rust more than others depending on the metallurgical composition. If you find that your meteorite piece is starting to rust despite your efforts, bring it to a goldsmith familiar with working in meteorite and they should be able to etch the iron oxide off the piece and re-oil it. It’s a bit more care, but totally worth it to make it last longer. Q. I would like to redesign a piece I inherited, can you reuse my gold and gems? A. Yes, and No. Generally speaking, reusing old gold as is can be problematic in appearance and durability, pitted metal or cracking and brittleness can occur so I don't really recommend it. If the piece is highly sentimental to you we can often find a way of using it. The monetary credit you receive for your old gold is the same whether we use it in the piece or send it to a refiner. As for sentimental gemstones, I can assess what condition they are in and let you know how much risk would be involved in resetting them. Q. What metals do you work with? A. I work with any colour of gold of 14-18kt (up to 19kt in the case of white gold), gold mokume, platinum, as well as sterling silver. I avoid using 10kt gold or less as 10kt is only 41.6% pure gold, so it is comprised more of other metals than actual gold. Low karat gold tends to be more problematic for pitting and cracking compared to 14kt+ and isn’t as nice of a colour tone. On occasion, I work with alternate metals like palladium, titanium, meteorite etc. Q. Whats the difference between kt (Karat) and ct (Carat)? A. Karat or kt is a method of determining and marking the fineness of gold. You will see 9, 10, 14, 18, 19, 22, and 24kt markings on jewellery. These equate to how much pure gold is in a piece. 9kt being the lowest amount of pure at 37.5% gold and 24kt being 100%. I use the metric system of determining and marking the fineness of gold. You will see my work stamped with .585 for 14kt which means that it is 585 parts out of 1000 pure gold (58.5%), or .750 for 18kt which means that it is 750 parts out of 1000 pure gold (75%). Carat or ct is a metric weight measurement used primarily for gemstones and diamonds. It is divisible by 100 to make a smaller unit called points, each point is equivalent to 2mg. 1 ct equals 0.2gr. Q. How long will it take to have my custom piece made? A. Generally speaking most orders are completed in 4-6 weeks. That said, each piece is unique and handmade so time estimates can vary. Sourcing rare gems, ordering during a busy season, and indecision on the clients part can all add to the timeframe. You will be provided with a completion date once we have decided on a design. If you have a date in mind, like a wedding date, birthday or anniversary, it is very helpful to know this in advance. Q. How much does a custom designed piece cost? A. The cost of a piece depends on many variables: what metals will be used, which gems and how many will be used, how much time will be required to create the piece, and more. I provide a rough quote once we have narrowed down the design. Your approval of the design and quote is required and a deposit given before any work can proceed. The amount for the non-refundable deposit is generally 50% of the total, but is sometimes negotiable depending on the piece. Knowing in advance what budget you have helps me to create a piece that fits all aspects of what you are looking for. Once you have made your final selection and have all of your items in your cart, you will be taken to a secure page where you can check out and make payment via your PayPal account or with a major credit card (Visa or Mastercard). For Canadian residents GST will be added on to your purchase automatically when you check out. For international residents you are responsible for any taxes or customs charges that may accompany your order upon entry to your country. Orders are sent out within 72 hours of receiving payment. Please choose the shipping method that is applicable to your order at time of check out. Please note that all shipping times are estimated and are counted in business days (excludes weekends). I want you to love your jewellery! If you are not happy with your purchase I will provide you with a full refund. Items must be in the mail enroute back to me within 7 days of you receiving your package. Your refund will include original shipping charges, but the return shipping charges will be the buyer's responsibility. Items must not have been worn and must be in the condition they were in when they arrived. Refunds will be issued only once merchandise has successfully been returned. All items being shipped are insured. For returned pieces, insurance is the responsibility of the buyer.